Q: Are your courses only for Singapore Citizens and Permanent Residents? A: We welcome all nationalities. However, Government subsidies are only applicable for Singapore Citizens and Permanent Residents. Q: When is the latest that I have to register for a course? We can only hold the reservation for 5 working days. The reservation will expire after 5 working days. Candidate will have to complete the registration within the given 5 working days. Q: What information is required for course registration? Fill up particulars, indicate preferred course schedule and sign LEACOV self- kiosk registration form. NRIC to upload in the self-kiosk registration form. Q: How can I pay for the course fee? Q: Can I postpone/cancel the class that I have registered for? 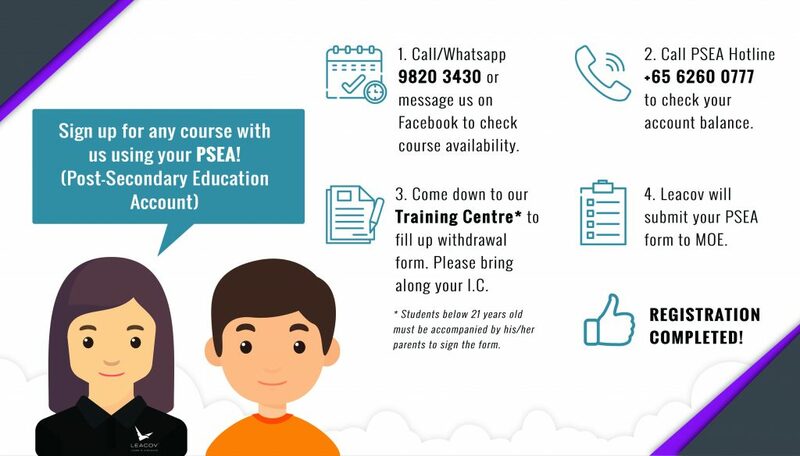 Candidates who request for postponement of their course schedule must inform Leacov Singapore via email/SMS/Whatsapp/phone call one week before their scheduled course date. There will be no refund of course fee if candidates decided to cancel the course sign-up. Q: What happen if I miss the class? A: If a candidate fell sick and failed to attend the class schedule or scheduled assessment, candidate must inform Leacov Singapore immediately and furnish a copy of medical certificate to facilitate the rebooking of class schedule. Failure to submit medical certificate for scheduled assessment, will have to pay the necessary administrative fee pegged to the assessment fee charged by POLWEL. A: There will be no refund of course fee for candidate who withdrew or dropped out of the class. When a course schedule is cancelled by Leacov Singapore due to unforeseen circumstances, candidate may obtain full refund of all fees paid. Q: Is the class confirmed upon registration? A: Leacov Singapore reserved the right to re-schedule or class any class. Under such circumstances, a notification will be sent to all registered candidates via email or SMS. Q: When can I receive my Statement of Attainment after completing and passing the course? A: You can download your Statement of Attainment (SOA) from www.skillsconnect.gov.sg. Log in using your Singpass. Click on the “View Achievement” and all your completed courses/training will be shown. There will be a downloadable file for your Statement of Attainment. You can view and download your SOA approximately 2 weeks from your Assessment Date. Q: How do I receive my certificate for full qualification? A:For a learner to obtain his/her certificate for full qualification, he/she has to submit copies of all the WSQ Statements of Achievement (SOAs) which will be attached to a request form. This request form together with the attachments will be submitted to SSG for their processing. Once SSG has completed their internal processes, the Certificate will be issued and sent to Leacov for collection by the learner. For your information, it is the Approved Training Organisation (ATO) where the student last attended training and/or assessment and obtained his last WSQ SOA which qualifies him for the training provider to forward the request form to SSG. Q: What if I cannot pass the assessment? A: LEACOV SINGAPORE’s trainers will assess and advise the candidates whether they are well prepared and capable of taking the assessment. Our trainers may arrange for another schedule for the assessment for those who are assessed to be “Not Yet Eligible”. You may re-sit for an assessment without having to go through the course again. There will be a re-assessment fee payable. LEACOV SINGAPORE will arrange for a re-assessment after the payment. LEACOV SINGAPORE allows the candidate to sit in the class again for revision before taking re-assessment without charging for any course fee. The personal information collected on this application form is used to maintain Leacov Singapore’s records in processing enrolment, course survey, monitoring academic progress, and for application of courses-related funding. By signing this form, candidate consents Leacov Singapore to use their personal information for course registration purpose. Candidate may refer to SSG-WSG website www.ssg-wsg.gov.sg for more information regarding the course funding scheme criteria. Payment for course fees must be made in full prior to the commencement of the class. Payment can be made using CASH, and by utilising SkillsFuture credit at our office during office hours between 9.00am and 6.00pm. To utilise Skill Future Credit, candidate has to be Singaporean & ≥ 25 years old. Candidate is advised to visit to confirm that the selected course is eligible for credit, and have enough credit to cover the nett fee payable inclusive of 7% GST stated in the tax invoice. Most of the relevant courses are approved or currently under review. Please note that Singpass is required to access SkillsFuture Credit portal. After upfront payment is done with Leacov Singapore, candidate is able to request for reimbursement up to 30 days before, or up to 90 days after the course date. Visit www.skillsfuture.sg/credit, log in with using SingPass ID, and select “Submit the Claim” for the relevant course. Follow the procedure to request full reimbursement. Failure to commence/complete the course on the course commencement / completion date. Termination of the course, for any reason, prior to the course commencement / completion date. If candidate would like to reschedule the class, he/she must submit a request via phone call/email one week before course start date. Kindly note that any rescheduling are subjected to availability. Candidate is required to bring his/her payment receipt and passport / working pass all the times when attending the courses. Leacov Singapore’s Trainer has the right to advise candidate whether they are well prepared to take the assessment on the original scheduled assessment date. If the candidate was assessed “NOT YET ELIGIBLE” for taking the assessment, Leacov Singapore may arrange for the next assessment when the candidate is deemed ready. Should the candidate insist to go for assessment on the original scheduled assessment date after being assessed as “NOT YET ELIGIBLE”, candidate has to sign a declaration form affirming his/her willingness to pay for the assessment fee once they failed. If candidate’s assessment is “Not Yet Competent” and requests for re-assessment, a re-assessment fee will be applicable. Note that assessment fee for each course varies. For WSQ Programmes, applicants will receive a notification from WDA to download their e-Cert via skillsconnect.gov.sg. (approximately 2 weeks from assessment date). Please note that Singpass is required to access SkillsConnect portal. Hardcopy of certificate is available and chargeable at ($6/sheet). Appointment is required via phone call/email prior collection.